Below are some tips that can help you stay safe in the event of heavy rainfall or flooding on and in and around the UNCW area. Leave extra time to make commutes. Do not attempt to drive through standing water. Do not circumvent barricades on campus; they are for your safety. Students should use their best judgment and notify their instructors if they are unable to attend class. Faculty and staff should refer to the Adverse Weather Policy and contact their supervisors with similar questions or concerns. Wagoner Drive in the area of Kenan Auditorium. The intersection of Reynolds and Cahill Drives. Parking Lots E, H and I. Relocate vehicles from flood-prone areas. Use alternate entrances to campus away from flood-prone areas, including the Hurst Drive entrance off College Road or Hamilton Drive from MacMillan. Park on the second level or higher of the parking garage. Avoid using the pedestrian crossing at Reynolds and Cahill; use Chancellor's Walk instead. 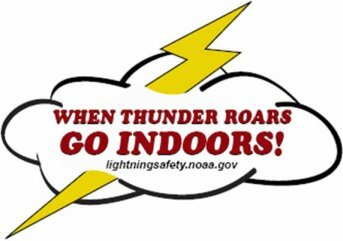 If you have a special event coming up where you will be outdoors, EH&S has a lightning detector available for use. Please contact Jodie Ruskin to check for availability. While winter weather in Wilmington is rare, it does affect UNCW occasionally. Students, faculty, and staff should be prepared if winter weather hits. It is the policy of UNCW to maintain normal operations to the extent that this can be accomplished in a safe manner during conditions of snow and ice. If we have snow and/or ice, the Chancellor and Crisis Decision Team will make a determination of the severity of the weather and if the University will officially close or have a delayed opening. To find out about UNCW closings and delayed openings, call the Emergency Information Hotline at 962-3991 or toll free at 888-657-5751, check the UNCW homepage and safety Web site (www.uncw.edu/safetyandemergency), check your e-mail, and pay close attention to local media. Priority will be given to supporting essential services to include supporting students in residence. Residential buildings are first priority when restoring telecommunications, electricity, HVAC, and plumbing. Campus Dining will ensure that there are adequate stocks of food supplies on hand for students who live on campus. After winter weather has occurred, UNCW emergency personnel will work to ensure the campus is safe and free of ice and snow on roadways and building entrances. During severe weather, employees can always refer to the Adverse Weather Policy if UNCW has not yet been closed or delayed.